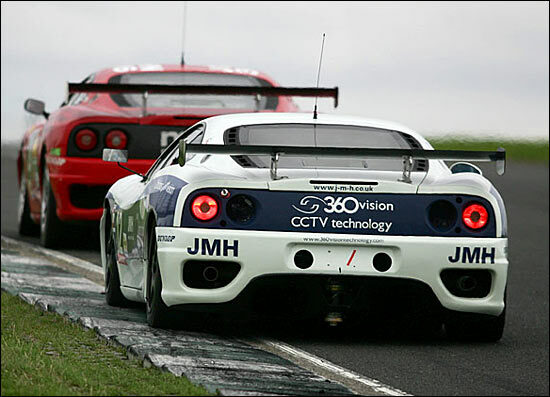 2004 British GT Cup Champion Adam Wilcox will continue his 2005 partnership with Ferrari owner Phil Burton into 2006, in the British GT Championship – the pair set to race the white and blue, JMH Automotive Ferrari 360 in the GT Cup Class this season. "Both Phil and I are excited about getting started testing with the Ferrari this month,” comments Wilcox, “and I am sure that we will be in a position to get on the podium if not win some races, with the momentum we gained towards the end of last season. JMH have totally rebuilt the car and we’re all ready to go." So the Porsches will face at least two Ferrari 360s in GT Cup, the JMH example joining the already announced David Dove / Calum Lockie car. Here's the JMH car at Mondello Park last year, where Adam Wilcox qualified on pole for race 2.